Remembering Starfish Resort Jamaica, now Breezes Resort Trelawny! 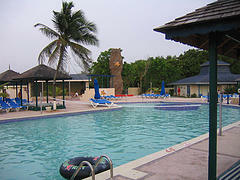 Operating under the Issa Group of companies, the Starfish Resort was marketed as a low budget all-inclusive family hotel. opened for business as Starfish Resorts in March of 2002. Now, even though it was owned and operated by the Issa/SuperClubs groups it was never marketed as a SuperClub property, which is understandable as the product was totally different than that of the Super-inclusive luxury high-end properties. Located in the quiet and history rich town of Falmouth Trelawny, Starfish Resort was just about 45 minutes from Montego Bay’s Donald Sangster international airport. This property catered for those persons who were looking for a more relaxed and laid back experience in a casual yet proficient setting. It was the perfect vacation spot especially for families (like ours) with small children - as it offered a very efficient babysitting service. This, of course allows the adults to act like kids and take advantage of the wide range or activities offered. In analyzing the results of the extensive market research done by Superclubs, it was realized that the tourism market was swaying towards properties that provided more than just the regular amenities and services. With this in mind it was decided that it was time to now move the Starfish property under the Breezes Brand, with the view of stepping up the service and amenities a few notches. And of course the endless supply of food was the icing on the cake for them! There were over six dining options to choose from including their open - air kitchen. Speaking with a representative from the now Breezes Trelawny, I was assured that the property now offers all we experienced and more. I'm anxiously looking forward to my next visit! Return to All Inclusive Jamaican Hotels from Starfish Resort Jamaica. Return to HomePage from Starfish Resort Jamaica.